In a lonely corner of the world, on the edge of No Man’s Land, sits Clocktower Fortress. It’s home to the 1121st Platoon of the Helvetian Army, and their newest member is a 15-year-old volunteer named Kanata Sorami, who enlisted to learn how to play the bugle. When she was a child, Kanata was saved by a beautiful soldier and found inspiration in the clear, golden sound of her trumpet. From that day forward, Kanata decided music would be her life. As the other platoon members train her how to be a bugler and a soldier, Kanata's enduring optimism will inspire them to look for happiness and beauty, even in a world haunted by war. 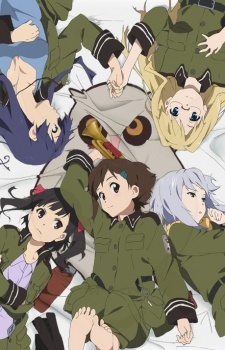 A criminally underrated slice of life anime about the power of hope in times of strife.